Stock chart analysis can be a vital tool for all investors. Their skillful use however, requires practice, and a great deal of judgment. Many people tend to think that someone who uses stock market chart analysis in his investment decisions must be a technician. A technician is often defined as someone who studies the phenomenon internal to the market – such as the patterns of price movement to forecast the future movement of the stock market as a whole, or of individual stocks. 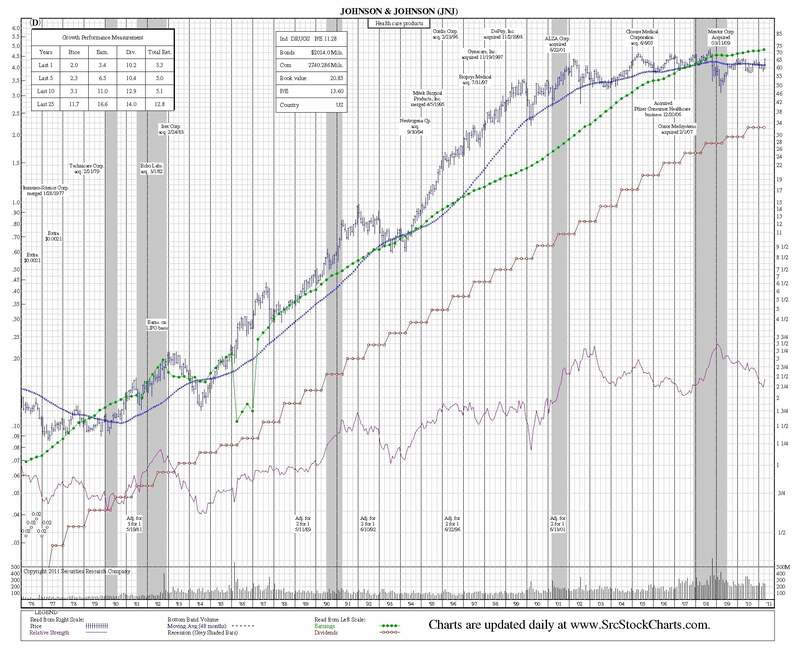 The fundamentalist (briefly defined as one who bases his investment analysis and decisions primarily on basic factors, such as economic condition, supply and demand, labor, products, earnings and dividends) has just as much use for charts. The pictures they show and the amount of information they provide help to make the task of investment selection much easier. Our advice is don’t pay attention to these labels but learn to use and profit from stock charts. The following sections will describe in detail the strategy behind using stock chart fundamentals to predict future performance. SRC’s “How to Read Stock Charts – Made Easy” will give you understand stock chart fundamentals as well as technical analysis – seeing important patterns, and interpreting the situations using stock charts. Start with the SRC’s Two Introductory Videos (each are about 4.5 minutes long), and then you can scroll down to “How to Read Stock Charts – Made Easy”. While these lessons are intended to be viewed in order they are broken into sections which are also valuable on their own as a review. Just click on each section to open. Everybody knows an investor who seems to have “20-20 Market Vision”. They appear to be able to spot market trends long before the crowd. They buy at or near the bottom, sell at or near the top, and schedule vacations for the long, boring middle. How exactly does someone do it? “20-20 Market Vision” investors we know don’t necessarily trade in corporate takeover targets. In fact, they largely ignore market fads and front-page news. What then is the secret of their success? In a word, vision. Your vision is a remarkable skill. No computer can yet match the human eye and brain in vision or visual pattern recognition. You can recognize friends you haven’t seen in decades, even though they may have changed over the years. You can recognize landmarks while driving, scarcely putting your conscious mind in gear at all. Your vision allows your brain to receive and interpret “data” almost effortlessly. What might take a computerized visual system thousands of data points and millions of calculations “to see,” you can see in a glance. This is what makes your vision so valuable. How does this apply to the stock market? Quite simply that every fact about the physical, economic, and financial world can, in some way, be reduced to a mark on a chart. Thousands of facts, therefore, can be placed on a single chart, and the results are displayed as a picture. In turn, this picture – composed only of dots and lines – takes on a life of its own. You can look at a chart, not only for the individual items of data it contains, but more importantly for the patterns those data points create. One of the real values of charting is that more often than not, the patterns created by the data are much more valuable than the individual data itself. Patterns can reveal trends and relations long before isolated facts give you a clue. This “How to” book will give you instruction and experiences in reading stock charts, seeing important patterns, and interpreting the situations portrayed by SRC Charts. Will the book make you into an ideal “20-20 vision” investor who never missed a top or a bottom? Maybe, maybe not. But there’s no question about it: the most successful investors are those who know the patterns and rhythms of the market, and can translate their knowledge into action. Whether or not the use of charts can correct your market vision to 20-20 is an open question, but you can certainly sharpen your sights. As you read, you will encounter many chart examples – the charts of SRC. Look at them with some care. You’ll find that practice improves the connection between your eye and your investing mind. As you refer to the charts, make sure you understand the symbols and notations on them. Learn the patterns while you study so that you will recognize them when they appear in the market. 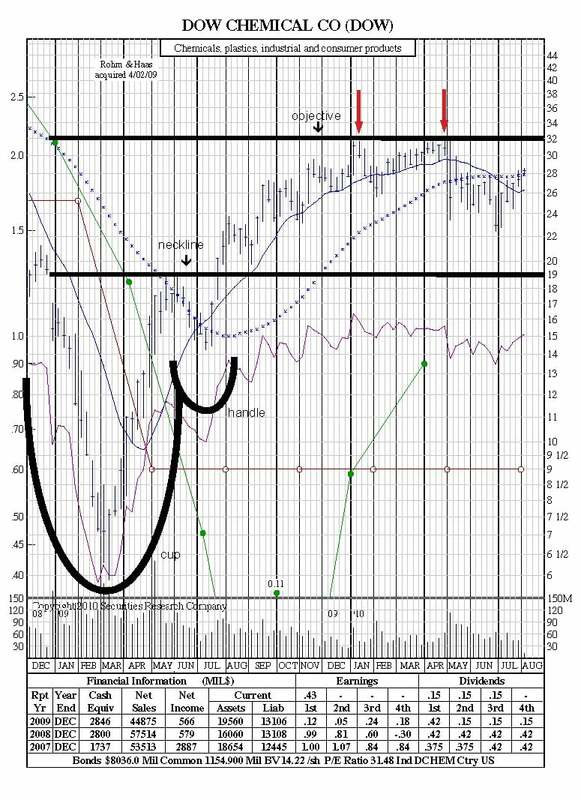 Charts can be vital tools for all investors. Their skillful use however, requires much practice, and a great deal of judgment. This paper will make it easier for you to become familiar with these tools. You’ll find that they can pay off. Many people tend to think that someone who uses stock charts in his investment decisions must be a technician. A technician is often defined as someone who studies the phenomenon internal to the market – such as the patterns of price movement – in an attempt to forecast the future movement of the market as a whole, or of individual stocks. Actually, the fundamentalist (briefly defined as one who bases his investment analysis and decisions primarily on basic factors, such as economic condition, supply and demand, labor, products, earnings and dividends) has just as much use for charts. The pictures they show and the amount of information they provide help to make the task of investment selection much easier. Our advice is don’t pay attention to these labels, but learn to use and profit from stock charts. Before we explore the use of individual charts, let’s discuss the features that we believe you will find of most value in helping you make valid investment decisions. There are two kind of price scales used on stock charts: semi-logarithmic (ratio) and arithmetic scales. Arithmetic scales are easy – the chart grid is divided equally and each space is a fixed amount: a fraction of a point, one point, two points, five points. 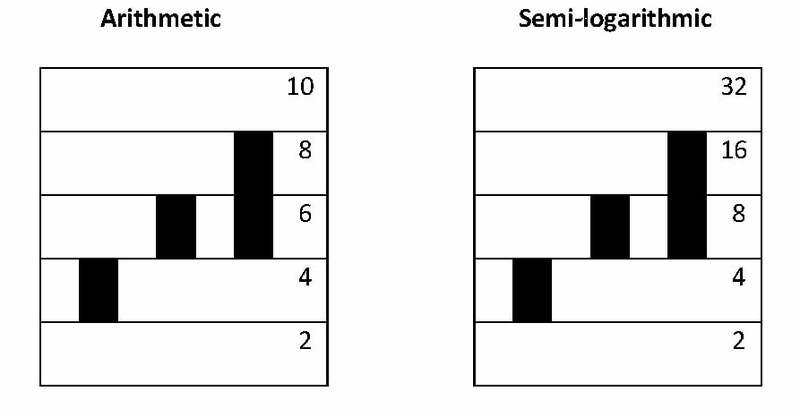 Semi-log scales have variable size spaces, each of which (whether a fraction, one two or more points) is sized in proportion to the price at each level. 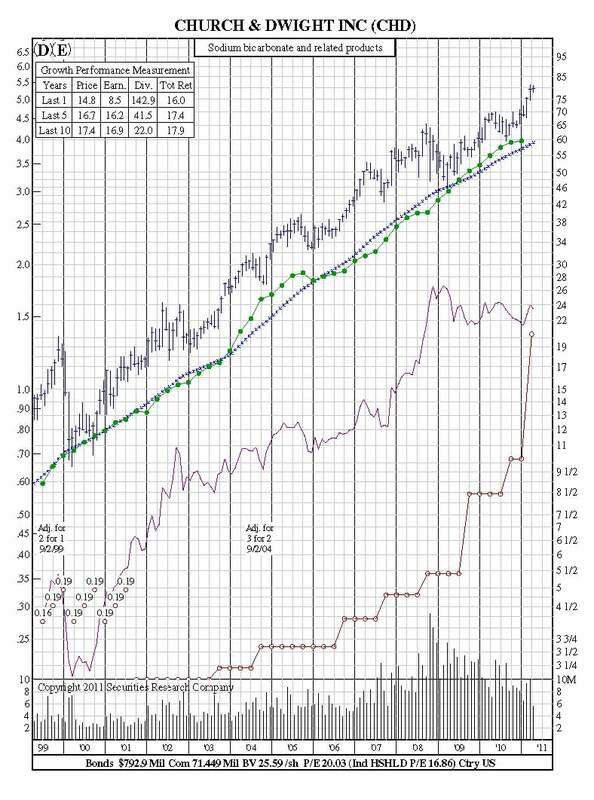 You will notice that SRC stock charts use the semi-logarithmic ratio scale. The great advantage of such as scale is that every movement on a chart is in exact proportion to every other movement. This makes it possible to compare one company with another company because of the uniform ratio scale. That is impossible to do with arithmetic scales. To illustrate: if a stock moves from 2 to 4, it has appreciated two points or 100%. It it rises another two points from 4 to 6, the gain is only 50%. To gain another 100%, it would have to move from 4 to 8. Even though the number of dollars or points may be greater at higher levels, the principle remains the same – the stock must move from 20 to 40 or from 200 to 400 to achieve a doubling, or 100% rise. This logarithmic scale is formulated so that any move of 100% (or any other percent) uses the same vertical linear distance on the chart, regardless of price level where it might occur. The arithmetic scale chart, does not work that way. A move on an arithmetic scale from 2 to 4 looks exactly the same on such charts as a jump from 4 to 6, or even an edging up from 98 to 100. Obviously, a move of two points has much greater significance when a stock is selling at 2 than when it is selling at 8, but the arithmetic scale conceals this. When using an arithmetic scale rather than a semi-logarithmic scale, the extent of a price movement, large or small, is easily hidden, and comparisons of one stock with another on such a chart are difficult if not impossible to make – and may even be deceptive. Earnings Per Share. Earnings on SRC’s Charts are adjusted for extraordinary items, such as sale or divestiture of real estate holdings or other effects on earnings which don’t pertain to the company’s core business. The exclusion of one-time events from earnings gives you the clearest picture of earnings performance – which is unique to SRC. Earnings on SRC Chart are read from the left scale – while prices are read from the right scale. With SRC Charts, price and earnings are set by a ratio of 15:1. This means if price and earnings line meet, the P/E ratio is 15. If the earnings line is above the price line, then earnings is less than 15:1. If the earnings line is below the price line, then the earnings are greater than 15:1. Coincidentily, if price and earnings are consistently increasing at the same rate the overall rate of growth can be easily defined at 15%. By consistently showing all of SRC’s Charts this way, you can easily and efficiently compare literally hundreds of charts for price and earnings growth. Earnings averages vary by industry – price/earnings ratios (P/E) which may be 10: 1 for one industry, and may be higher or lower for another – so it’s important to understand what the P/E ratio is for the industry the stock belongs to. One very common theory holds that depending on the industry and company, earnings would fall to meet some future price or the price may rise to meet future earnings potential. Dividends. Dividend payments are displayed directly on SRC’s charts. Dividend payments, like earnings, are read from the left scale and are plotted on an annual basis. Dividends above or below the charts, as well as specials, extras, irregular payments are placed on labels. Dividend growth can give the indivual a very good idea of how the company is performing. Are dividends growing? Is there consistency to the dividend payments? How does dividend growth compare to price and earnings growth? Given the recent turbulence in the stock market, as well as more investors nearing retirement years, the dividend a stock produces can significantly increase the overall return for a stock. Growth Performance Measurement. The growth performance of a company is provided in a block that appears in the upper left corner of each long-term company chart. The percent gain or loss for price, earnings and dividends is given for specific time periods as indicated by the number of years shown. This feature gives the investor an excellent snapshot of the company’s performance over time from one year to 50-years – without having to use other reference sources. An additional feature is the bold circled P,E, or D that may appear above the block. 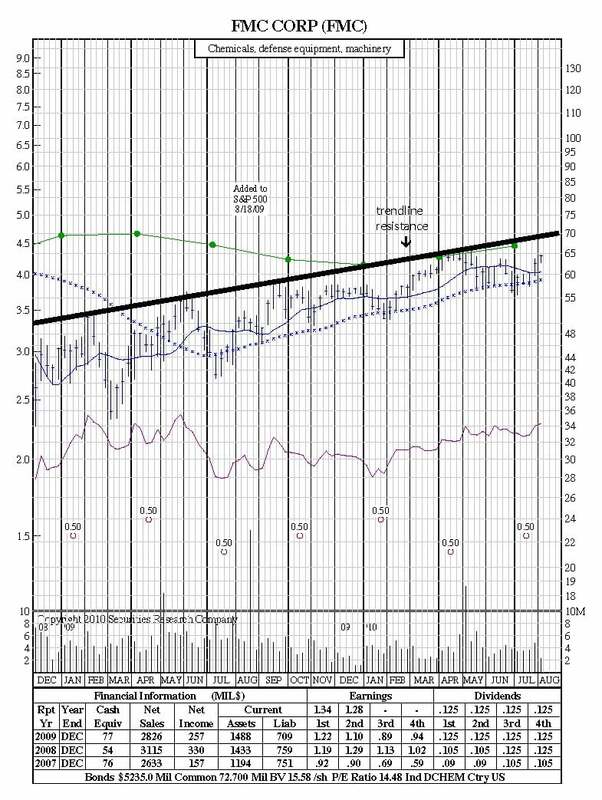 This highlights price “P”, earnings “E”, or dividend “D” when any of the three meet or exceed pre-set parameters for: price growth greater than 20%, earnings growth greater than 15%, and dividend growth greater than 10% for a specified period of time for that chart type. Relative Performance. 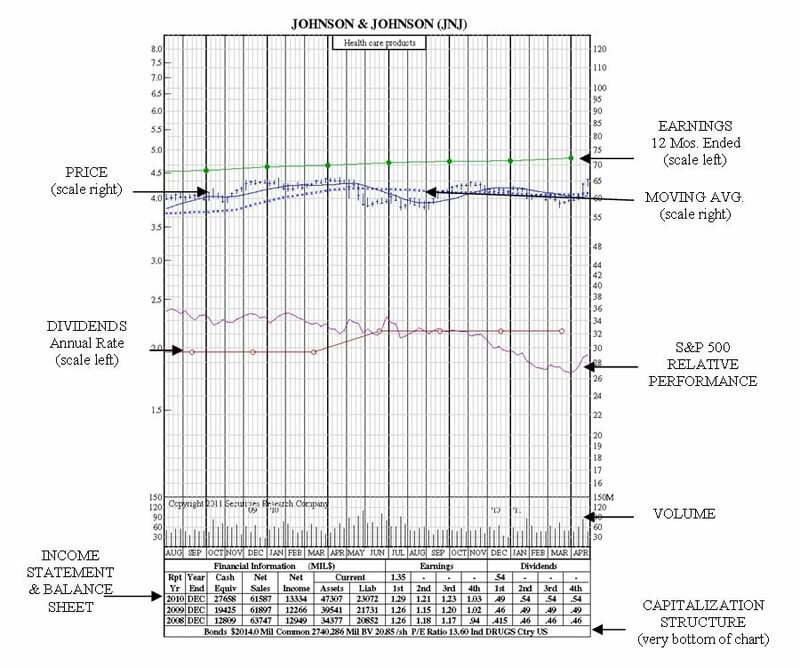 The SRC relative performance is used to graphically depict in an easy-to-read manner a stock’s performance relative to the widely used S&P 500, and is read from the right scale. It shows how a stock is doing not in absolute terms, but how it is performing relative to the stock market as a whole as represented by the S&P 500. Thus, if a stock is doing better than the S&P 500 – its relative performance will go up. In fact, a stock could be declining – but at a slower rate than the market – and the relative performance line would be rising. If a stock is performing worse than the S&P 500 – either going up slower or declining fast, the relative performance line will head downward. Similarly if the stock performs about the same as the S&P 500, the relative performance will be horizontal. Moving Average. One way of tuning out short-term gyrations from the chart of a stock’s price is the use a Moving Average which is read from the right scale. SRC uses different moving averages depending on the amount of time covered by chart. For example, with SRC’s 12-year Charts, uses a 48-month moving average which is the average of the previous 48 months closing prices. Each month this average is extended, it measures a different time period, as earlier months are dropped off and the latest month’s price is averaged in. This average is an essentially conservative measure, whose effect is to “damp out” wild price swings, seasonal variations, and other factors. Keep in mind, however, the it tends to diminish the effect of anything that happens quickly, no matter how important it might be. One technical analysis theory holds that the time to buy stock is when the stock price is above the moving average, dips towards it, but does not break through it, and then starts up again. In other words, if the moving average acts like a support level, watch carefully, it could be a buy signal. Stock Splits. 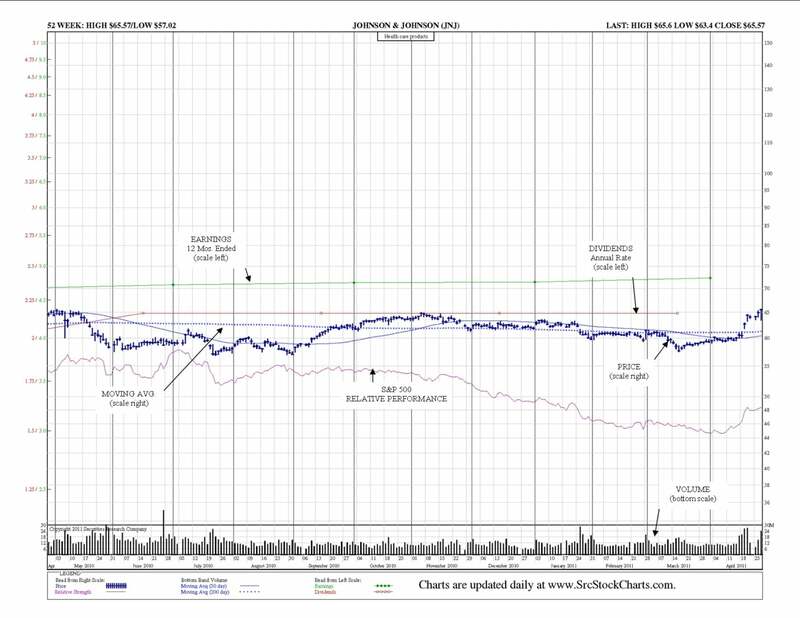 All stock splits are noted with a label on the chart – and all SRC Charts have been fully adjusted for stock splits. Take, for example, a company with 100 shares of stock priced at $50 per share. The market capitalization is 100 × $50, or $5000. The company splits its stock 2-for-1. There are now 200 shares of stock and each shareholder holds twice as many shares. The price of each share is adjusted to $25. The market capitalization is 200 × $25 = $5000, the same as before the split. Ratios of 2-for-1, 3-for-1, and 3-for-2 splits are the most common, but any ratio is possible. Splits of 4-for-3, 5-for-2, and 5-for-4 are used, though less frequently. Investors will sometimes receive cash payments in lieu of fractional shares. It is often claimed that stock splits, in and of themselves, lead to higher stock prices; research, however, does not bear this out. What is true is that stock splits are usually initiated after a large run up in share price. Momentum investing would suggest that such a trend would continue regardless of the stock split. In any case, stock splits do increase the liquidity of a stock; there are more buyers and sellers for 10 shares at $10 than 1 share at $100. Other effects could be called psychological. If many investors believe that a stock split will result in an increased share price and purchase the stock the share price will tend to increase. Others contend that the management of a company, by initiating a stock split, is implicitly signaling its confidence in the future prospects of the company. In a market where there is a high minimum number of shares, or a penalty for trading in so-called odd lots (on multiple of some arbitrary number of shares), a reduced share price may attract more attention from small investors. Small investors such as these, however, will have negligible impact on the overall price. Corporate Actions. Important single events in a company’s history are noted on SRC Charts. These events could be an acquisition, merger or divestiture of another company or division, and can explain why there is a change in the price, earnings or dividend payments at a certain period in time. Volume. Each SRC Chart gives volume information in the panel at the bottom of the chart. Notice that the vertical scale on this chart is not logarithmic, but arithmetic. Volume is most often represented by height. Volume is crucial to interpreting price data. An extremely high or low price reached on very light volume may indicate the opinion of only small number of investors: possibly not good data. However, any price supported by massive buying or selling volume, conversely, can usually be taken seriously. Like heavy turnout in a presidential election, heavy volume is a mandate, and likely to indicate wide acceptance of the valuation of a stock. SRC has two charts giving you the short-term view. The 52-Week Daily Charts are plotted on a daily basis, and the 21-Month Charts, are plotted weekly. The 21-Month Charts. SRC’s 21-Month Charts are useful to both the fundamental and technical investor alike. The 12-Year Charts provide the investor with longer look at the performance of a stock – it’s this longer view that begins to show performance trends over time. 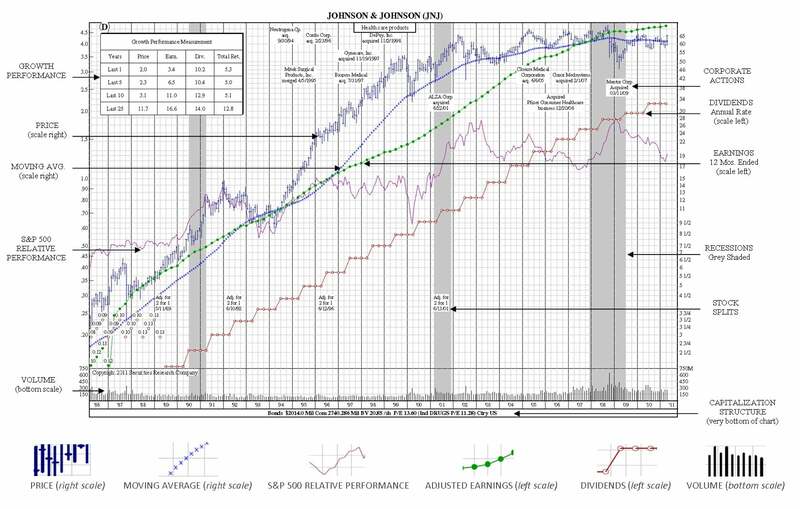 Charts provide the investor with longer look at the performance of a stock – it’s this longer view that begins to show performance trends over time. It usually pays to know as much as possible about the companies you invest in. But there’s a difference between current data and ancient history. How far back does it pay to look at a company’s performance, and how should the information be interpreted? Let’s find out more in “How to Read Stock Charts”. 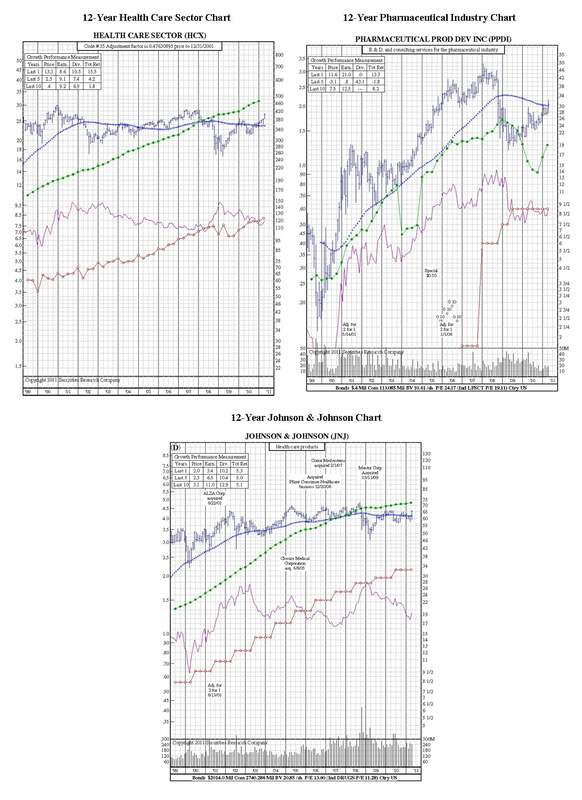 SRC publishes three compilations of long-term charts: 25-Year Charts, 35-Year Charts, and 50-Year Charts. These long-term charts are included with the SRC Green Book of 35-Year Charts, and the SRC Book of 50-Year Charts. All of SRC’s long-term charts contain one additional feature that SRC’s shorter-term charts don’t have. SRC’s long-term charts display recessionary periods that are grey-shaded, so that you can clearly see how the company fared during recessions as well as expansion periods. Why is this important? When you begin to examine the long-term picture of a company, you will see that history often repeats itself, with stock prices and earnings following similar patterns during recessions – as well as how the stock performs when the economic recovery begins. 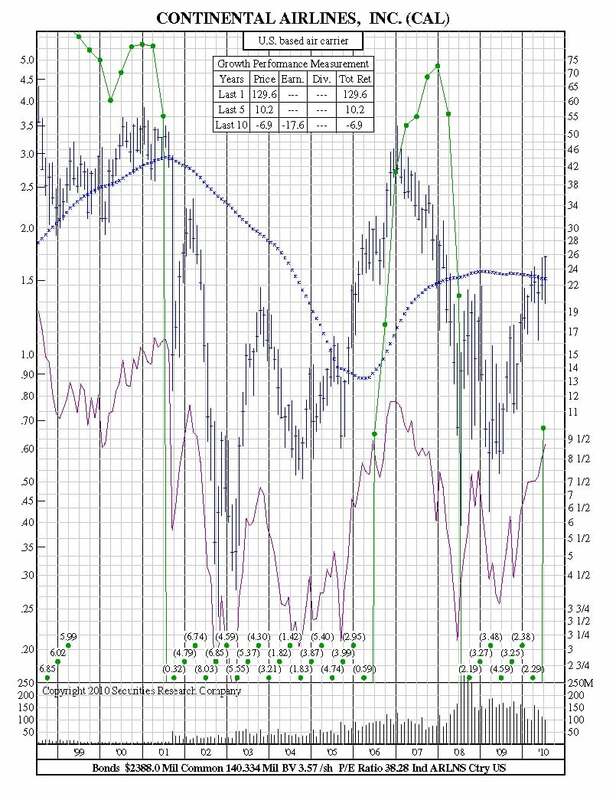 These charts, with their thousands of plotting points, each represent a vast reserve of factual information for the investor and analyst who wants to follow earnings, dividends, and price patterns, plus the relationship of each to the other. In addition, each chart quickly shows where a stock stands today in relation to various points in the past. This long-term record permits the study of various trends and formations, especially those which may not be evident in short term charts. The long-term data are also a powerful lesson about the cyclical nature of the American business, and the inter-dependence of our entire economy. No company, not even the strongest, is completely protected against recession. No company can fail to be buoyed by a rising tide, unless it has significant underlying problems. Long-term charts show the market in its realism, with fads and fashion ironed out. 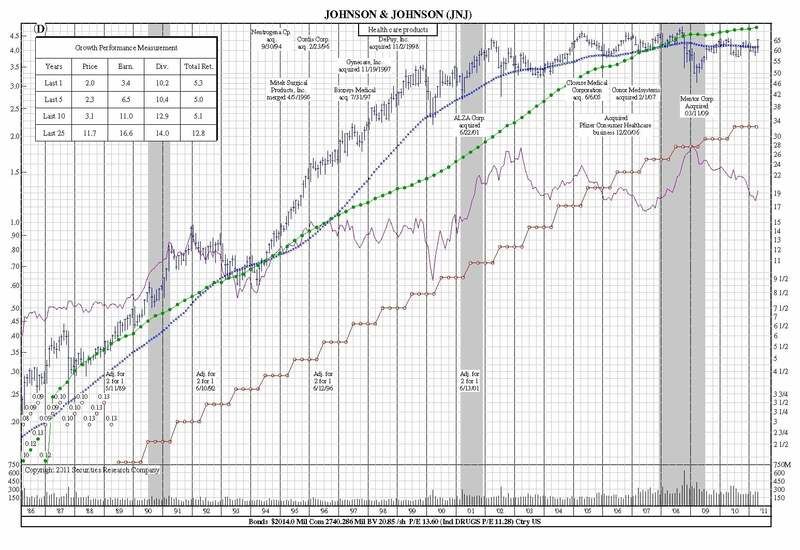 Below you will find the 25-year, 35-year and 50-year charts for Johnson & Johnson. 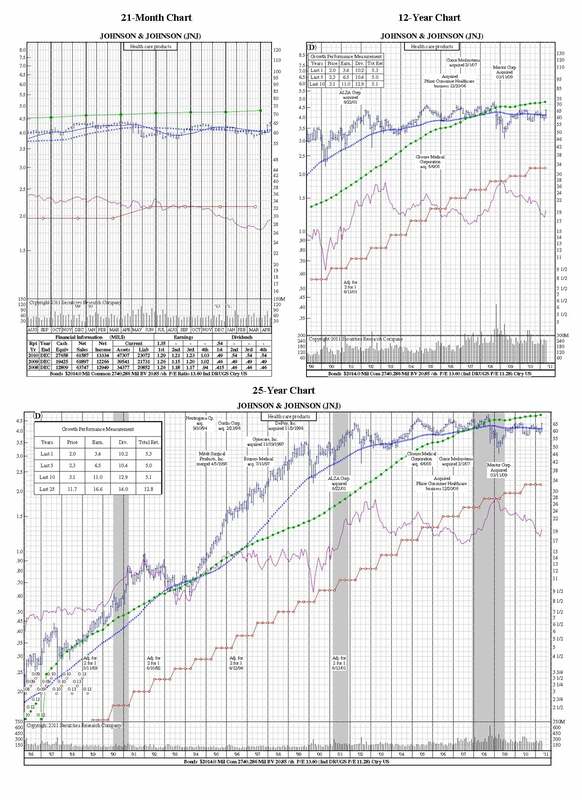 Notice the consistency in earnings and dividend performance over these time periods; how the stock price fared during the recession and expansion periods; how the relative performance to the S&P dipped at the start of each expansion period, and then recovered. It’s these valuable pieces of information that can shed light on how a company may fare during similar economic circumstances in the future. 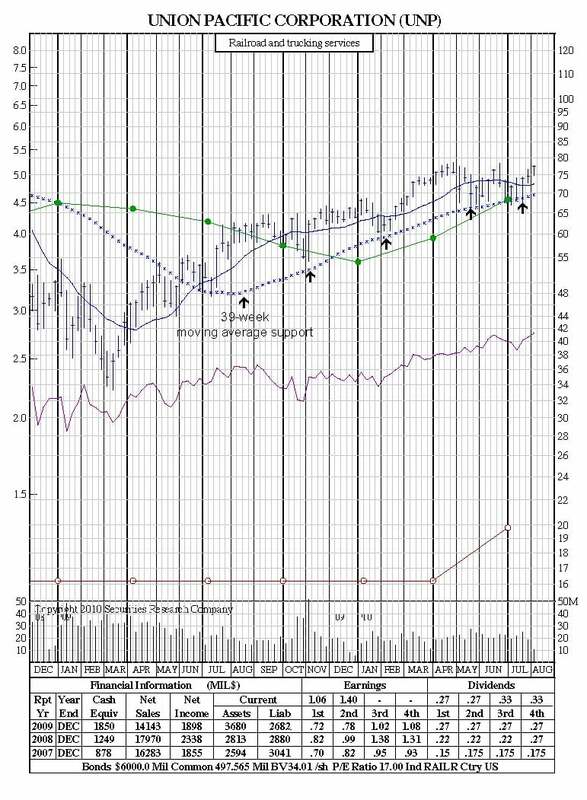 The first place to start when reviewing stock charts are the sector and industry charts. 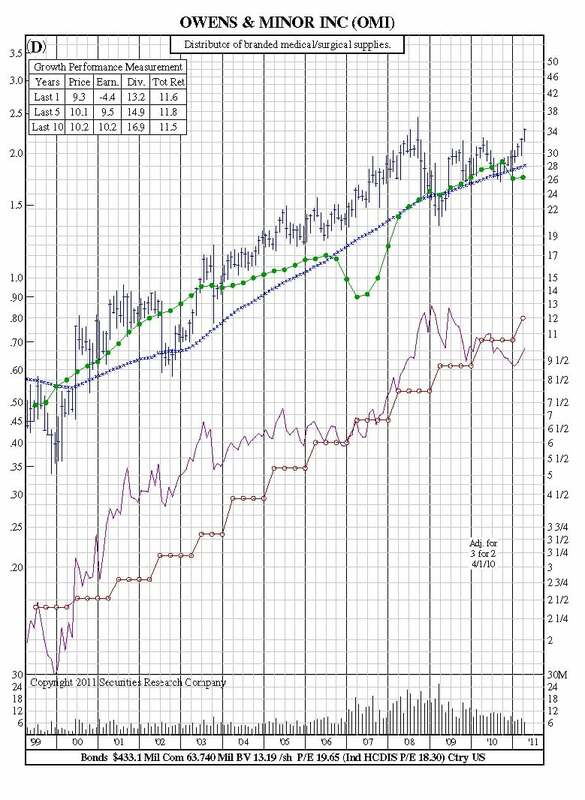 These charts are key components to giving a solid view of which industries are performing best, because many believe that if you pick stocks from the right industries, you’ve won half the battle. Another key component to stock selection is to understand the P/E ratio for each industry – not all industries have the same P/E ratio – hence companies in those industries may have higher or lower ratios depending on the type of business. Once you have a particular industry’s P/E ratio, then you can judge how a particular stock is performing compared to other stocks in that industry. Here is the picture of a successful company. It shows steadily rising earnings which have been reflected in higher stock market prices and a greater market evaluation of earnings. It also shows that the performance has consistently been better than the market generally. Along with rising profits, dividends have been increased almost annually. On the other hand, the record is not a straight upward line, for even the most outstanding companies are subject to some extent to the business cycles and market fluctuations. This chart portrays the record of typical stock, demonstrating the wide fluctuations which characteristically occur in prices, earnings and dividends. This is the type of company which benefits greatly from the upside of an economic boom and suffers on the down slope (such as companies in the entertainment and travel industries). 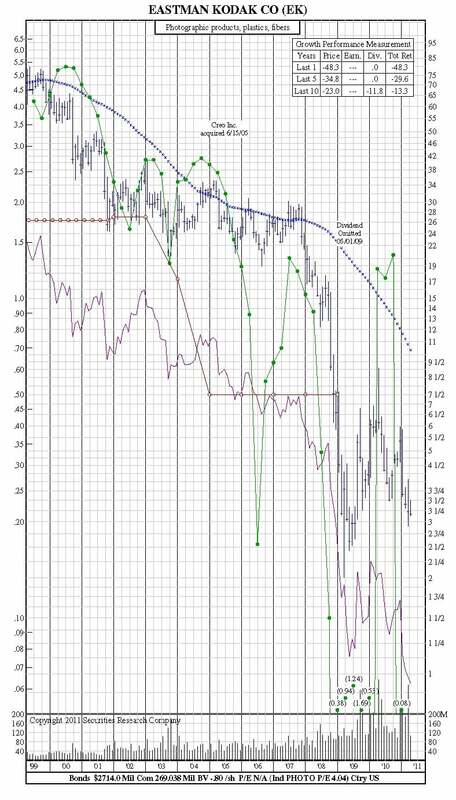 The chart also shows the tendency of these stocks to exaggerate the swings of the general market. In reflection of the risks involved in such issues, the price/earnings ratio is usually lower than the market average. With this record of wide price movement, cyclical stocks make good trading vehicles but obviously timing is of the utmost importance. Of much less interest from a capital gains viewpoint than growth, are companies who are classified in “income” category. Relative to market, such stocks often have a less than attractive record. But they are not to be discarded since they do have appeal for the investor mainly seeking a good yield and the likelihood of gradual dividend boosts, along with some moderate appreciation. They are generally less vulnerable to cyclical changes than other groups, though they may be importantly affected by money rate fluctuations. This chart portrays the record of a stock with a declining pattern. It is not a straight line, but one interrupted by successive rallies under favorable market conditions. But the trend is persistently down, possibly reflecting a declining industry, weak management, obsolete products, loss of competitive position – all resulting in lower earnings and dividends. This type of company “with few friends” is often sought out by bargain hunters who see in it a possible turn-around situation. The time frame for viewing a stock can tell one story for looking at one time period and another for a different time period. 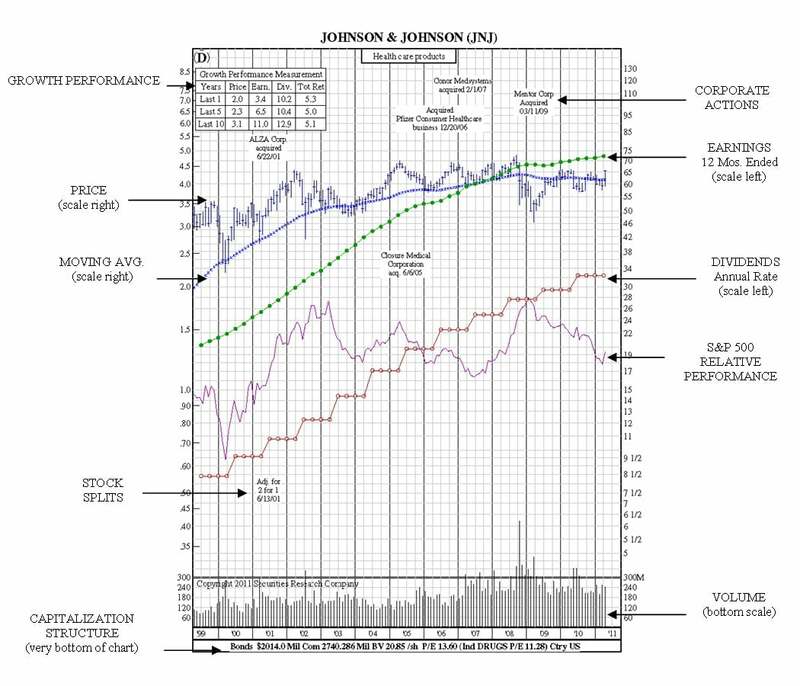 See Johnson & Johnson’s 21-Month, 12-Year, and 25-Year Charts below. Picking the right stocks can be easily down by reviewing the Chart either in a book or online. SRC offers both – print and online. And research is made easier using the filters in ChartScreen’s Online Service. Filters and screening tools can be adjusted up or down, or additional filters can be added/or deleted to suit your specific needs. SRC’s “How to Read Stock Charts” is written to help you with only one type of analysis, and that is the use and interpretation of charts. No system, technical or otherwise is infallible, but reading charts and seeing trends and formations can often put you on the road to profit. As any investor knows, the study of the stock market in action is a very complex subject. We can simplify matters a bit by stating a truth about the market: prices move in trends. These trends can be portrayed graphically on a chart. There are also formations which can be seen on these charts. 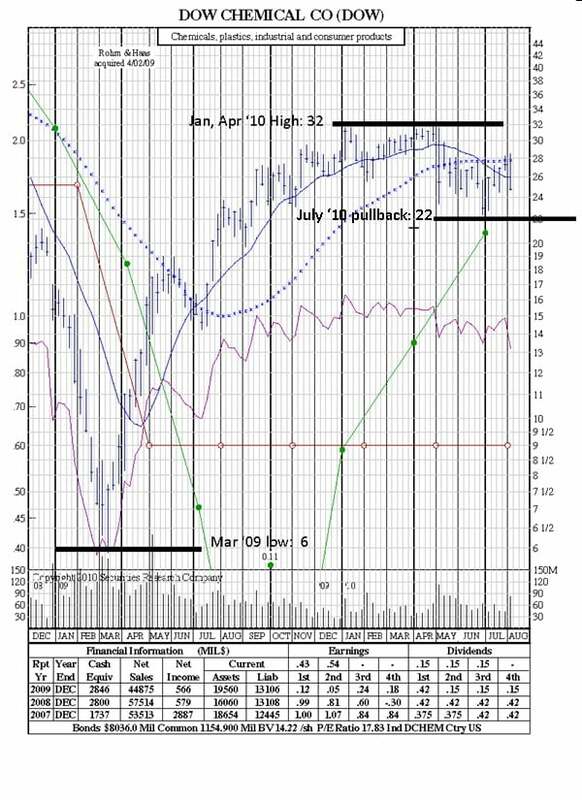 What follows are several of the ways technical analysis can be used with SRC’s Charts. You will find explanations and illustrations of formations and technical indicators like support levels, resistance levels, channels, head & shoulders, cup & handle, and Fibonacci Retracement. Sometimes a chart looks like the price is rising as if there was a floor beneath them. Usually this indicates that many people in the market firmly believe that the stock is intrinsically “worth it” based perhaps on a previous low, or on the company’s book value. 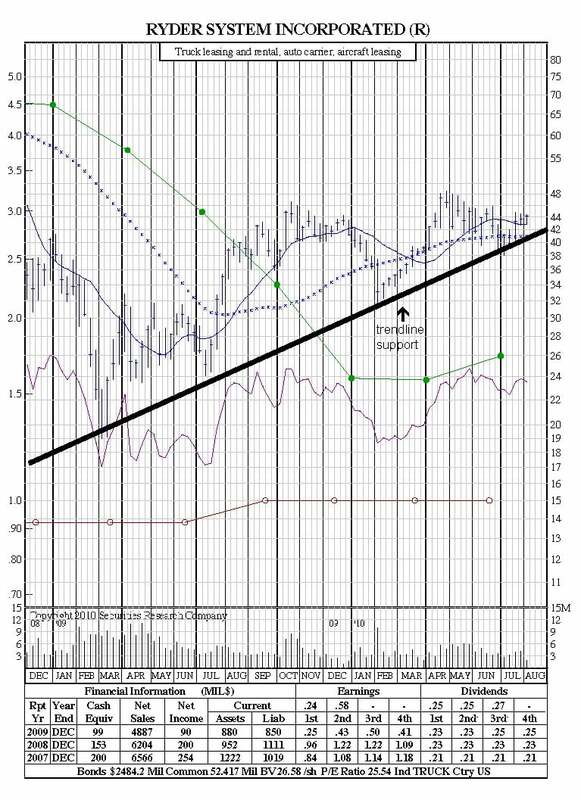 In the chart below, Ryder continues to trade above trendline support. Each successful test of the trendline demonstrates that the long-term upward trend is intact. A break below trendline support would be a sign of weakness and potentially signal a trend reversal. In the chart below, the 39-week moving average has provided dependable support for UNP, with numerous successful tests since July ‘09. The stock continues to rally after pullbacks to the moving average, whereas a break below it could suggest a trend reversal. Resistance Levels are ceilings, which are just like floors – but in reverse. The price of a certain stock may come up to – but will not exceed the resistance level. This level may be arbitrary, or it may have been set by the collective calculations of many investors on the basis of P/E ratio or previous highs. In the chart below, FMC appears to be trading below trendline resistance originating in Feb ‘09 and currently at $70. Another failure to break above the trendline would suggest another pullback or more sideways action, whereas a break above the trendline would be a bullish event. If a stock’s price fluctuates around a common line, a channel formation exists. A channel is defined by drawing one line connecting all the recent tops and another connecting all recent bottoms, usually in a diagonal pattern. Characteristically, a stock will continue to fluctuate within the channel lines. There are up and down channels, as well as channels inside a longer channel. 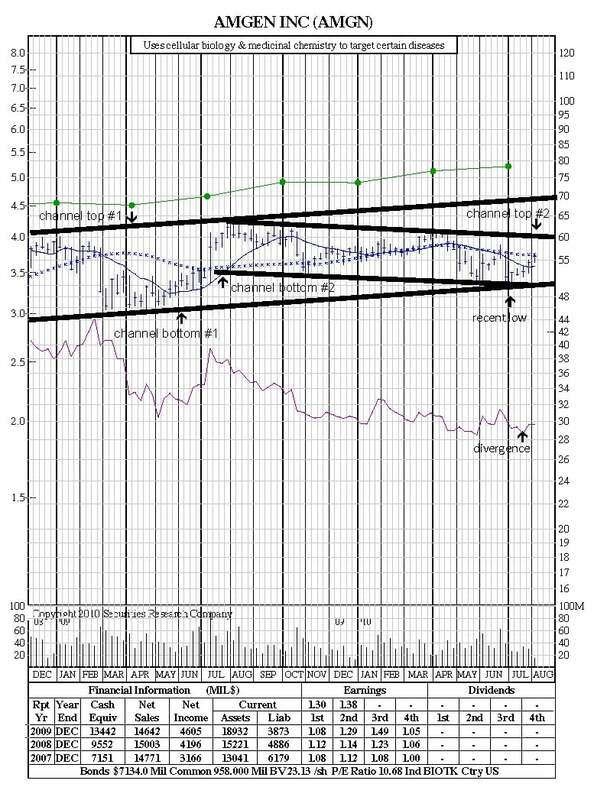 Technical theory says that if the stock’s price breaks out of the channel, it will continue in the direction of the breakout, rather than continuing to fluctuate. 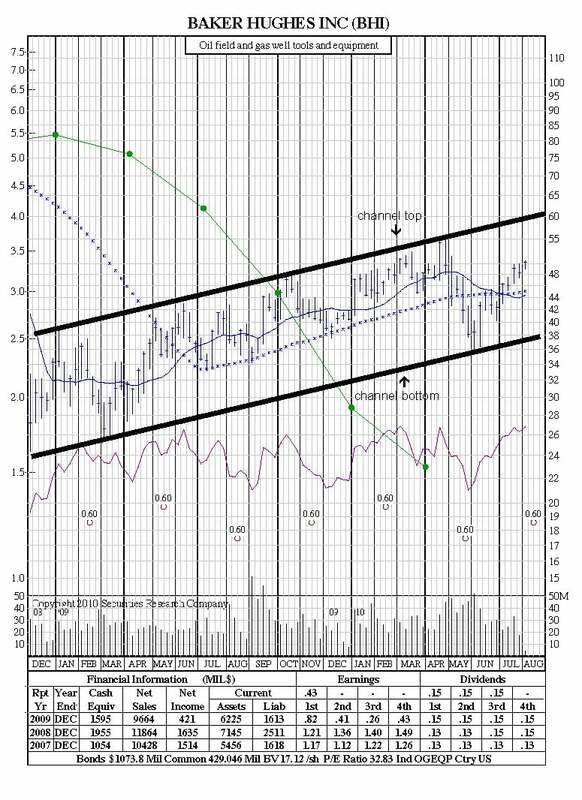 In the chart below, AMGN appears to be trading within two trading channels: a long-term ascending channel and a shorter-term descending channel. It tested and held at both long-term and short-term channel bottom support at $49 and appears aimed for a test of its shorter-term channel top resistance at $60. 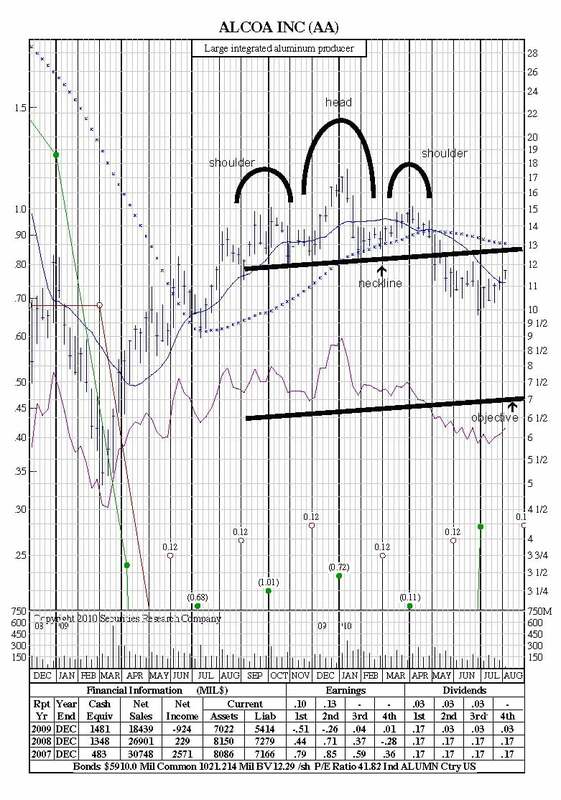 A break above $60 clears the way for a move to $70, while a failed test suggests a pullback, possibly to form the right shoulder of an inverse head & shoulders similar to 12 months ago. Additionally, AMGN’s relative performance line is showing strength compared to the general market, as its recent low in price did not produce a low in the performance line – a bullish divergence. A cup-and-handle pattern resembles the shape of a tea cup on a chart. This is a bullish pattern where the upward trend has paused, and traded down, but will continue in an upward direction upon the completion of the pattern. This pattern can range from several months to a year, but its general form remains the same. $32, and tested it twice before pulling back (Jan ’10, April ‘10). Fibonacci Retracement is based on the key numbers identified by mathematician Leonardo Fibonacci in the 13th century. However, Fibonacci’s sequence of numbers is not as important as the mathematical relationships, expressed as ratios, between the numbers in the series. In technical analysis, Fibonacci retracement is created by taking two extreme points (a peak and low point) on a stock chart and dividing the vertical distance by the key Fibonacci ratios of 23.6%, 38.2%, 50%, 61.8% and 100%. Once these levels are identified, horizontal lines are drawn and used to identify possible support and resistance levels (see above). In the chart below, DOW went from a Mar ‘09 low of 6 to an April ’10 high of 32, a move of 26. It then pulled back to 22 in July ‘10, a move of 10. 10/26 = 38.4% retracement. Key Fibonacci retracements are 38.2%, 50% and 61.8%. Stocks will often pull back to a Fibonacci retracement level just before resuming their current trend. It’s now time to put what you’ve learned into practice! Step 2. 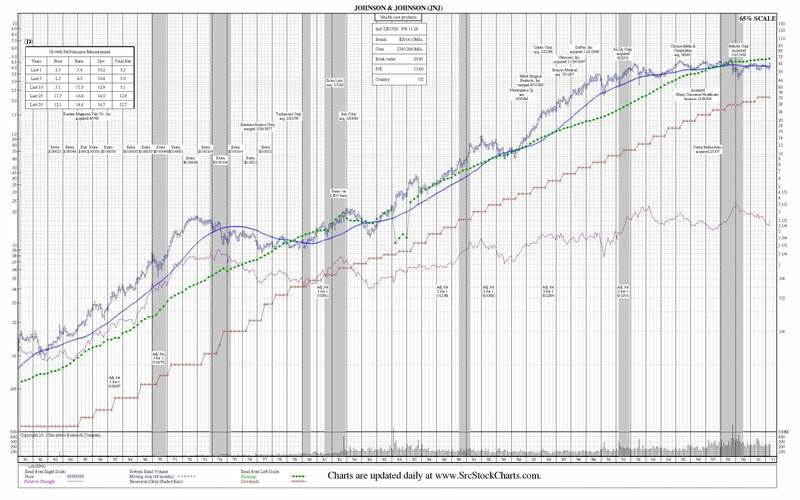 Using the SRC Chart Legends above, begin to look at the fundamental performance for each of DJIA company. Do you see any short-term or long-term trends? Are earnings consistently in line or supporting their price levels. Given the earnings trends, is there presently or opportunity of risk? Step 3. For technical investors or technical analysts – what are you seeing in the 21-Month Charts? Also how do the fundamentals of the company look? Are prices gaining steam ahead of earnings performance? Step 4. Set up a demo to ChartScreen Online Service, so you can see first hand how the filters, screening and portfolios work. And we turn the mouse over to you so you can try the searches and filters on your own. It’s a snap to learn and use.